(CNN) – President Barack Obama's campaign spokesman said Monday that neither the president's campaign nor the White House asked Newark, New Jersey Mayor Cory Booker to produce a web video clarifying his take on a spate of recent campaign attack ads. Ben LaBolt was asked by CNN's Brooke Baldwin if the campaign requested the Booker backtrack. "We did not. These are his own views in the video. He made absolutely clear that the discussion of Mitt Romney's private sector tenure was legitimate," LaBolt said. LaBolt later added, "He released that video of his own volition. We did not ask him to do so." 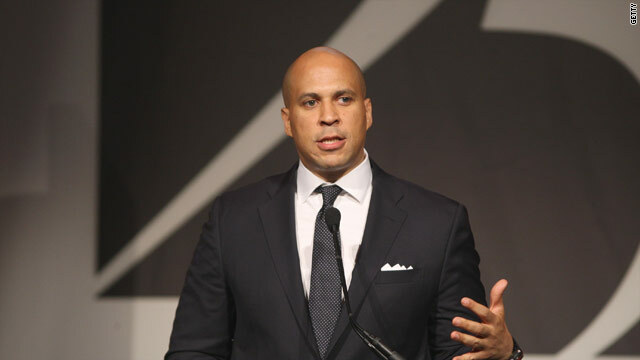 Booker released the YouTube clip on Sunday after appearing to chastise fellow Democrats on NBC's "Meet the Press." "I'm not going to sit here and indict private equity. To me we're getting to a ridiculous point in America," Booker said on NBC. "If you look at the totality of Bain Capital's record, they've done a lot to support businesses, to grow businesses, and this, to me, I'm very uncomfortable with." In the video released later Sunday, Booker attempted to clarify his comments, saying Mitt Romney's tenure at Bain was fair game for political scrutiny. In his follow-up, Booker used almost identical language in justifying the Bain attacks as Obama's campaign staff. "Let me be clear," Booker said. "Mitt Romney had made his business record a centerpiece of his campaign. He's talked about himself as a job creator. And therefore, it is reasonable, and in fact I encourage it, for the Obama campaign to examine that record and discuss it. I have no problem with that." Uproar over Booker's comments was fueled Monday by a web video from Romney's campaign, which used Booker's "Meet the Press" appearance to make it seem like attacks on Bain from Democrats were backfiring. The video also used clips of former Democratic Tennessee Rep. Harold Ford and former Obama administration official Steven Rattner to paint Democrats as split on the effectiveness of the Bain attack ads. In defending the Bain assault, LaBolt emphasized Democrats were not trying to vilify the entire private equity industry. "We're not questioning the private equity industry as a whole," LaBolt said. "We're questioning what lessons and values Mitt Romney took from that experience and whether that's the economic philosophy you would like to see in the Oval Office." @BEND Forward – Obama sat in front of anti-American, anti-white Rev. Wright for 20 years. Why isn't it fair to go after Obama for that? Obama has associated with a LOT of questionable far left radicals by his own admission. Why are all of these not "fair game"? Well, well, for once we agree on something! Either it's ALL fair game for both sides – without whining or complaint – or certain area's are off limits. Since I doubt the latter will EVER go into effect, then Wright, Bain, records (and lack therof) and policies, and every other subject should be considered "fair game". Depends on how ugly you want it to get..
Great news! And I'm sure we need to know EVERYTHING about Obama and his past, including the disclosure of his school records and papers. Mr. Transparency has kept them in lock down for years now. Why do we know about Romney and a dumb prank when he was in high school but not about the person running the country? If Romney is lauding his efforts while at Bain, then Bain is absolutely fair fame in the discussion. @BEND Forward – "We have Chicago gangsters running the country now." Yeah, great !! Let's replace them with the Boston thugs instead ! Obama's suppression of all things prosperity related is sickening to us too Mr. Booker. Demonize and divide Americans is what Obama has exceled at for the last 3.5 years. We have not have a more inept and unprepared President in my lifetime than Obama. A day will come when we do not have the $$ in america for half the country to suckle for a lifetime. @Valentina – I came to this great country, the United State of America, when I was 15 years of age. Through personal responsibility and hard work I can say that I am in the upper middle class bracket. Yeah, yeah.. me too! Big deal... Apparently you still have a lot to learn. Have you not educated yourself on the history of US politics. . if not, you have not done your civic duty and should have no reason to vote. The GOP of today is NOT the Reagan's GOP. Not even close. A vote for Mitten's will continue this country toward economic ruin by following long-failed GOP policies. Don't believe me if you don't want... but PLEASE check the facts before you waste a vote. @Bend and yada yada: "Obama sat in front of anti-American, anti-white Rev. Wright for 20 years." Not all of Rev. Wright's sermons were like those that made him notorious. And President Obama did not attend all of Rev. Wright's sermons. Most importantly, President Obama is NOT Rev. Wright. I don't expect you to get this, but thinking people will and do. I will remember you said that – only you will never know because Willard will NEVER be president. Now quit your lying like all of you do (on these posts) regarding your success and get back to making up those Hotel beds. They may not have specifically asked him to release a new video but I'm sure the message was very clear. Probably something like "Fix this!" There may have even been and implied "or else". Amazing! We have a rookie president telling a rookie mayor to back peddle on his legitimate opinion concerning the truth in an attacking campaign strategy. Of course Rmoney's Bain history is fair game; he's the one who brought it up, along with all his mindless followers who think being a vulture capitalist somehow qualifies him to be president. But if over 70% of the companies Bain dealt with (basket cases ready to go belly up) are now thriving businesses employing tens of thousands of workers, how does that qualify as "a vulture capitalist"? None of these companies will bat a 1000. Does that mean they can't try to save SOME of the companies and jobs? Or would you prefer that all of them go belly up in order to be fair and ensure the same outcome for all? So here we go again with Obama having to do Damage Control. 1st it was Biden and now Booker. Can't Obama control his people? They're like a Circus, at least it keeps us entertained. @Valentina: @ Expat American – FYI: I came to this great country, the United State of America, when I was 15 years of age. Through personal responsibility and hard work I can say that I am in the upper middle class bracket. One of the reasons you succeeded in this country is because of the infrastructure and opportunity it gave you. Mittens' and the GOP's vision for America is to turn it into the type of country you LEFT (one where the top 1% own and control everything, there is virtually no middle class, there's a huge poverty class, minimal public education, unpredictable infrastructure and basically a dog-eat-dog world). Which dumb prank are you talking about? When he sheared a kids head full of hair, or where he walked a visually impaired man into a closed door and then laughed himself silly? Pranks you might appreciate, but for the rest of the country, not so much ... eh? Might want to give is a rest for a few days, you are barking yourself into a frenzy today more than is normal even for you. So now Bain is the Democrats latest target, okay let's use it to convince people in the unemployment line that they are there because of Romney. In the typical Democrat way it is somebody else's fault because something or someone caused it to Obama, Obama is Bush's victim, it doesn't matter that Obama made poor choices. I see you guys are talking about Romney cutting a kid's hair but I don't see where you guys are talking about Obama pushing the little girl Coretta down to the ground, Obama talked about it in his book Dreams from My Father. What in the world is this obsession about President Obama's high school records, college records, and school papers? I'm pretty old, voted in a lot of elections, and never before have I ever know anyone to expect school records. I've never seen them for any other presidents or know them to be of interest. This is such a strange obsession. His records were adequate to get him into Harvard where he was President of the Harvard Law Review. Could someone please send me a copy of Reagan's elementary school records and any finger painting that he did? Nuts, this whole obsession is really nuts! Robmey has enough of his own words to do his own demise. I had cheesy grits, trees are the right height, I put my dog in a crate and strapped him down on top of the roof of my car. Do you think honestly this is the type of President we want making Foreign affairs decisions, taking care of American people, and goint to G20 summits. I can imagine what he will say there, "boy the hotels are the types I like to stay in, some of my friends own hotel chains". I would truly like to know by all you Obama haters what exactly you expected from him and what you would consider success. He's done an amazing job considering all the obstruction he's had to deal with and the total disaster that was left for him to clean up. You haters really have nothing because all you spout are contradictions – "Obama is weak and a failure and hasn't kept his promises", "Obama is taking away our freedoms", "Obama is being a dictator". This is some of what you've been spouting and I wonder, if you don't like his policies, why would you call him a failure for not fulfilling his promises (policies) – you should be happy that he hasn't (even though that isn't the case). He's actually put forth many ideas that your Repubs have supported in the past, but you're too blinded by hatred to see that. It's just pathetic. OBAMA 2012 & DEM HOUSE & SENATE!! Wow to the Bain attack ad!! Romney didn't shut down that Steel Mill, he was working for the Utah Olympics. Did the Obama campaign purposely mislead the public? I guess so. @Bend Forward: I think you are the person that used the name THE TRUTH AND NOTHING BUT THE TRUTH. You need to get a life and stay off this site for awhile. You have nothing to contribute whatsoever. Get some help and learn how to express yourself in a mature civil way. You have no idea that your internet address can and will be traced. If you are employed your employer has the authority to read everything you say. IF YOU ARE SO SICK OF THIS COUNTRY LEAVE IT WE WON'T MISS YOUR KIND. There are some articles this morning that Wall Street firms are not so eager to support the anti-prosperity President. Booker raises money for his political career in that area also so I am sure that is why he responded. With Obama constantly bashing these companies I can't imagine them wanting to fund another four years of pure FAILURE.